Do you need to force quit an unresponsive Mac app? Is your Mac seeing the infamously dreaded spinning beachball of death? Is an app failing to respond to any input? Maybe you have an errant process or two? When any of the above happens, you’ll probably want to forcibly quit the application in question, and that’s what we’ll cover with this walkthrough, showing you how to force quit apps on a Mac with six different methods. Whatever your skill level with Mac, you’ll find a way to forcibly exit out of an app. Read on to learn more! Take a moment to review the tricks below, and then remember a few keyboard shortcuts or sequences now to save yourself a hassle later if you find yourself in a situation where you need to force quit a Mac app. And yes, these tricks work in all versions of Mac OS and Mac OS X. Starting with one of the best and easiest is the system wide Force Quit function: Hit Command+Option+Escape from anywhere to bring up the simple “Force Quit Applications” window, then click on the app name to select, followed by clicking the “Force Quit” button, this will end the app immediately. 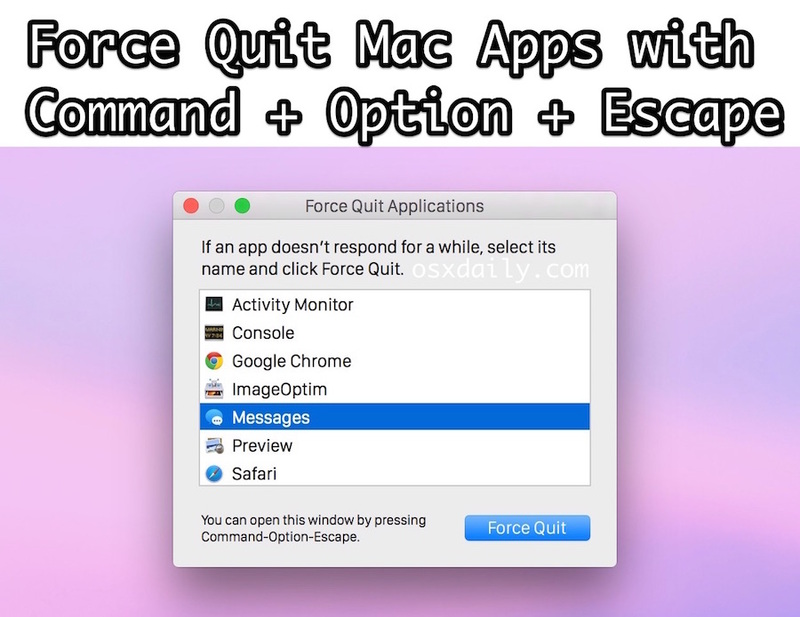 That Force Quit keyboard shortcut is probably the best combination of easy and power when force quitting apps in Mac OS X, since you can access it with a keystroke, select and force quit multiple apps if necessary, and summon it from anywhere. Hold down Command+Option+Shift+Escape for a second or two until the app forcibly closes. 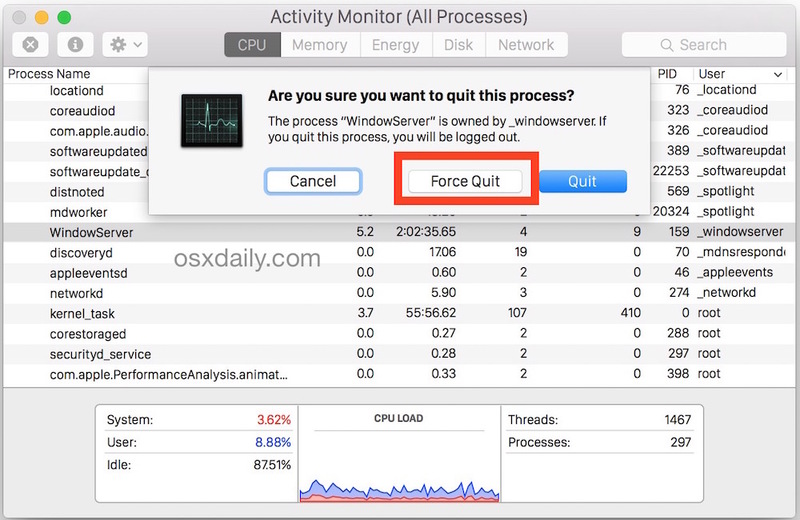 Be sure to do this while the app you want to force quit is the foremost application on the Mac, as it will force quit whatever is active when held down. This is not well known, but offers perhaps the quickest way to force quit the foreground application in Mac OS X and a very good keyboard shortcut to remember. Option + Right Click on an apps icon in the Dock to bring up the “Force Quit” option, selecting this will kill the app without any confirmation. 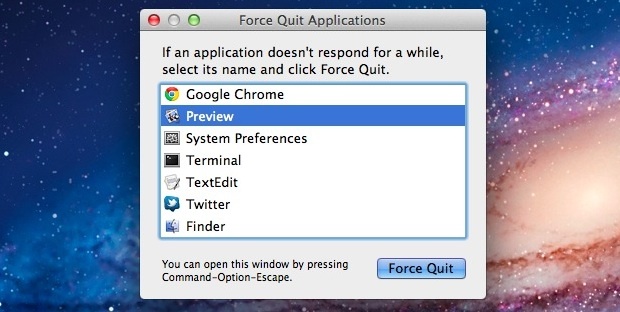 Hold the Shift Key and click on the  Apple menu to find “Force Quit [Application Name]”. This is easy to remember but not necessarily the most powerful method, since sometimes an application is completely unresponsive and the menus are inaccessible. Activity Monitor is a powerful way to forcibly quit any app, task, daemon, or process running on Mac OS X. You can find it in /Applications/Utilities/ or open it from Spotlight with Command+Space and then type ‘Activity Monitor’ and the return key. Using Activity Monitor is very easy: Select the process name or ID you wish to kill (unresponsive apps will usually appear as red), and hit the red “Quit Process” button. You can think of this as the Mac equivalent to a task manager from the Windows world and a more complex version of the second tips Force Quit window. If one of the previous methods fails, this will almost certainly work. The kill commands will take out just about anything, and sometimes have the side effect of not honoring Versions, Window Restore, and Auto-Save, so be cautious of potential data loss. Another option for command line users is the pkill command, which works similar to the kill command to forcibly exit and close applications and processes. What’s your preferred method of forcibly quitting an app? Mine is the Command+Option+Escape trick, or by using Activity Monitor, but I often turn to the command line for more complex situations. Remember, when you force quit an app, you will lose any unsaved data in that application. Don’t forget that. 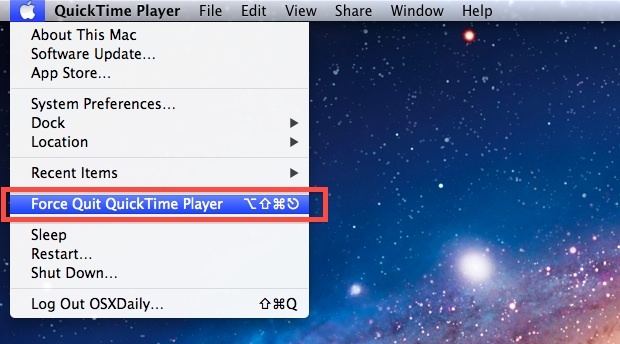 You can also force quit several Mac apps at the same time if you find yourself in a situation requiring that. Mac users without an ESC key will instead need to get accustomed to force quitting with Touch Bar, which can sometimes be a few extra steps to access the escape option. Rebooting a Mac will also initiate soft quit, but if you force reboot a Mac or turn it off, then it will basically force quit out of apps as well – that’s pretty extreme though so it’s best to avoid that method for quitting any app as it’s not intended for really anything other than a totally frozen Mac. This obviously covers the Mac, but from the iOS side of things, you can force quit apps on iPhone, iPad, or iPod touch, as well, depending on the version of iOS and the iOS device itself. Swiping up from the bottom of the screen on a new device and then swiping up to discard the app will force quit on any new iPhone or iPad, and older models can force quit by double-pressing Home button to then initiate the quit app process. And finally, much older iOS versions can accomplish this by holding down the Power button until the slide to power option appears, and then hold the Home button until the app closes. Do you have any other tips or tricks for force quitting Mac apps? Share with us in the comments below! Had NO idea about the first one (adding shift to command-option-escape): NICE or the last one (killing apps on iOS). Thankfully, I have had very few problems with stuck apps on iOS. Thank you for the information. Brilliant. I used # 5 – Activity monitor. Works well. Thank you. tried all six to try to quit frozen iphoto, none of them worked? Finally! I finally got rid of it thanks to you and Activity Monitor. I just wonder why none of the other sites I searched suggested Activity Monitor as a way of disposing of files that you couldn’t get to go away any other way. Thanks again. What about killing a MAC window? Do you always have to use red button at the left upper corner? Does MAC have any keyboard shortcuts for that? Command+w closes window, but the application still runs. I have always just turned off the power to my mac, then on again. Is this bad for the computer? Command+Option+Shift+Power key will reboot the Mac, that does not force quit an application. You can hold down Command+Shift+Q to Force Quit an application in OS X. All your stuff doesn’t help since the cursor & track pad is frozen! My Macbook which I got I think in 2009 has started crashing. I did force quit last night when it crashed then froze, and on trying to restart I entered my password and the little progress line got about a third of the way across and won’t budge from there. I have force quit a couple of times after letting it rest an hour or so, but no change. Is there anything I can do or is it time to take it to a Mac repair? Thanks for your artical it really worth to know. Good help. Thanks a lot. Thank you. All old news to long time mac user but here’s a question that may or may not have an answer to. Is there any way to quit just the process that is causing the app to hang rather than force quitting the entire app? The 10 unsaved documents open right now would benefit from knowing the answer to this if indeed there is one. Nothing works. The panel opens the cursor remains spinning. Force restart only option for me. When an OS X machine freezes during reboot, you can find online a list of options, including resetting the P ROM, booting to safe mode, booting from your recovery partition, and booting from a CD/DVD, a USB ROM or drive. If you have two Macs with FireWire ports you can try booting the freezing Mac into Target Drive mode to access any critical files. Your worst case situation will come if you have encrypted your entire hard drive. You can’t force quit system tasks without root/admin access and trying to force quit those processes will likely cause unexpected behavior like a log out or system crash, so if you can’t force quit the system process you probably should not anyway. This is really for apps and processes running above the system level, not low level kernel resources or system tasks.